From the Top Menu Bar, select the Global Search box to go directly to a specific student’s History report. Enter the student’s last name or first name or student number, then click on Submit. Or, to view all students on a particular roster, select Reports, then go to Step 3. Another way to access the report is to click on the REPORTS flip card on the Launchpad. On the flipped side, use the arrow to scroll to the next page and select Student History Report. Click on the Student History tab. By Student (default setting): Click on the magnifying glass to generate a list of all students on the roster. Use the Student Search box to find a specific student. Enter the student’s ID number, last name, or first name, then click on the magnifying glass icon. View a specific student’s report by clicking on the last name or first name. Or click on the view icon (eye) on the far right to view the selected student’s report and then scroll to the next student’s report. Change Roster to select a roster from a different school year. Only School and District Level Users may view previous rosters in this report. Reorder any column by clicking on the column header. Search for a specific roster of students by class. The search functions vary depending on your User Level (Teacher, School, or District) as shown. Once you have selected the desired class, click on a student’s first or last name to view his/her report, or click on the View (eye) icon to the far right of the student’s name. Teacher Level User: Select a Grade, Course Group or Course, and Period, then click Refresh. School Level User: Select a Grade, Course Group or Course, Teacher, and Period, then click Refresh. District Level User: Select a Grade, Course Group or Course, School, Teacher, and Period, then click Refresh. Name: Student’s last name, first name. If you have used the View icon (eye) to enter the Student History Report, you may click on Previous to go to the previous student on the roster, or Next to go to the next student on the roster. Student Identification: Includes ID number, Date of Birth, School of Attendance, Current Grade, and Demographics - English Proficiency, Special Education, and Ethnicity. Show/Hide Demographics: Check the box to see Demographics, or uncheck to hide. Search Functions: Search for assessments by Grade Level, School Year, Subjects, Standards, and/or Date Range. The Date Range is automatically calculated based on available data for your search. Use the calendar icon to set a smaller date range, if desired. Click Refresh. Search Assessments: Use the drop down to search for a specific assessment within All Assessments, Local Assessments, or State Assessments. Assessment tabs: View All Assessments (default setting), Local Assessments (See Step 6), State Assessments (See Step 7), Standards Progression (See Step 8), and Class Schedule (See Step 9). School year: By default, all assessment years are shown. Click on the orange circle with a minus sign to close the year’s information. Click on the green circle with a plus sign to open. Assessment Info: Assessment Name, Subject, Test Date, Level Tested, Percent Correct (if applicable), Performance Level, Raw Score (if available), Scale Score (if available), and Hide in Exports option (temporarily hides the chosen assessment from being included in the Export download). Expand assessment information: Click on the green circle with a plus sign to expand the data, then click on the orange circle with a minus sign to close. Exclude Standards in Exports: Hides standards when exporting report to PDF. Download icon: This report may be exported to PDF (portrait or landscape) or Excel and then printed. Expand All/Collapse All: Click to open or close all years and all assessments. Click on the Local Assessments tab to view classroom, school, and/or district level assessments the student has taken during the current or prior school years. Item Bank, Answer Key Only, and Express assessments the student has taken will be listed under a teal header. Performance Based A+ Assessments the student has taken will be listed under a blue header, with results for all assessment objectives (sub-scores). Filter By: By default, all State Assessments will be selected for viewing. Click on the assessment name you wish to view. The most recent year’s results will be displayed first. Click on the green circle with a plus sign to open previous years’ results. Click on each tab to view only the specific assessment as shown below. Hover over each tab to view the assessment name. Click on the Standards Progression tab to view a report of the student’s performance on all standards associated with the assessments in the Student History Report. The data will automatically update as the student takes more assessments aligned to standards. Show: Mastery/Non-Mastery or By Performance Levels: Data can be viewed by Mastery/Non-Mastery (default view) or By Performance Levels as set in District Defaults. Mastery Value: If not set and locked by the district, this value can be changed. Enter the new value and click Apply. Scores at or above the Mastery Value will be shown as Mastered. Key: Mastery/Non-Mastery/Standard Not Included: Each acts as a filter. Click on Mastery to deselect it and view only Non-Mastery scores. Click on Non-Mastery to deselect it and view only Mastery scores. ELA, Math, Science, or other content area standards: The list of standards aligned to all assessments the student has taken is displayed on the left, with the assessment names listed across the top. Open the standards by clicking on the green circle with a plus sign. Close the standards by clicking on the orange circle with a minus sign. Hover over the standard number to view the standard details. Download icon: Export to PDF or Excel. Highest % Achieved, Mastery Ratio (number of items mastered based on the Mastery Value over the total number of items for that standard), and Standard Average. Show: Mastery/Non-Mastery with Color Scale: If not set and locked in the District Default Settings, the Color Scale can be set in My Preferences. Note how the Key changes to include a range of colors that can be used as filters. Please see the Help document, Basic Navigation: My Preferences, for more information. Show: By Performance Levels: The performance levels are set in District Default Settings by the District SchoolCity Administrator and may vary from what is shown. Use the Data drop down menu to add a Standard Average column to the report. Use the Key as filters to view results for one performance level. PDF View: The PDF view displays the student’s assessment results by standard. Class Schedule: Select the Class Schedule tab to view the student’s schedule for the current school year. Elementary students’ Class Schedule generally shows only one teacher, depending on the district. Students who are assigned by course will have a schedule listed by period and section, along with the teachers’ names. Bulk Printing (District Level User shown): Instead of printing one report at a time, a bulk printing request may be made. 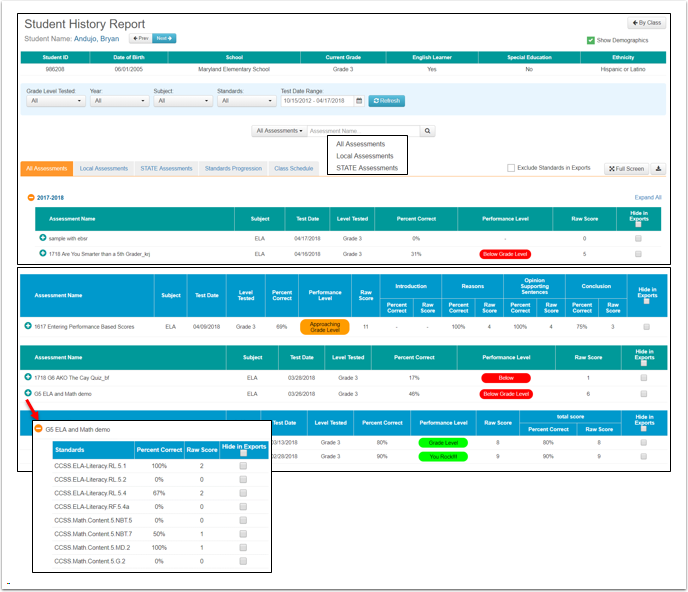 Select Bulk Printing to send a print request for multiple reports. Step 1: Select the students to include Grade(s), School(s), and Teacher(s). Step 2: Select the assessments to include on each Student History Report All Assessments, only Local Assessments, and/or only State Assessments Subject(s) and School Year(s). Refine the Test Date Range by checking the box and selecting the dates using the calendar icon. Exclude Standards if desired. Step 4: Print by: Select how you would like the PDFs to be grouped. For example, if you select School, Teacher, Period, then the PDFs will be in alphabetical order by School; within each school, they will be in alphabetical order by teacher; for each teacher, they will be in order by period; for each period, the reports will be in alphabetical order by students’ last names. Only one selection can be made. Click on Send to Bulk Printing when all steps have been completed. A message will appear confirming the bulk print request. You are given the options to “Take me to Bulk Printing” or “Exit”. When you go to Bulk Printing, your request status will indicate “Received” and the download icon will be gray. 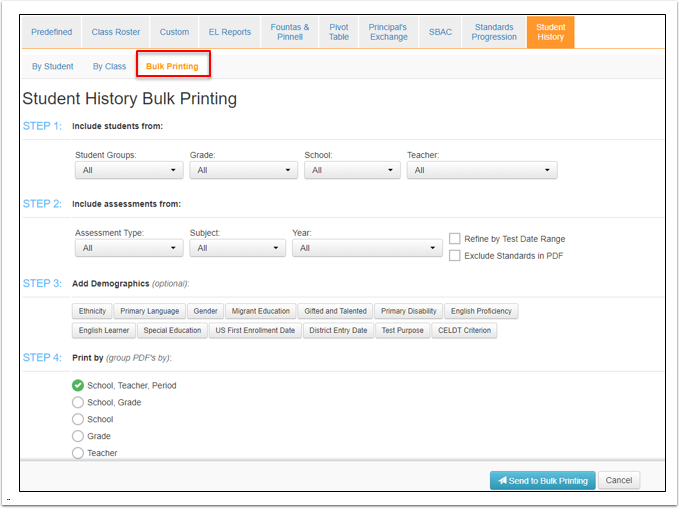 Manage Bulk Printing: Once your request has been processed by SchoolCity, a number will appear above the Bulk Printing icon (printer) in the Top Menu Bar. Click on the icon. Select the Student History tab. The request will show as In Process in the Status column and a gray download icon in the Functions column. When the file is ready to download, it will show as Completed in the Status column and with a green download icon in the Functions column. Click on the green icon to download your file. 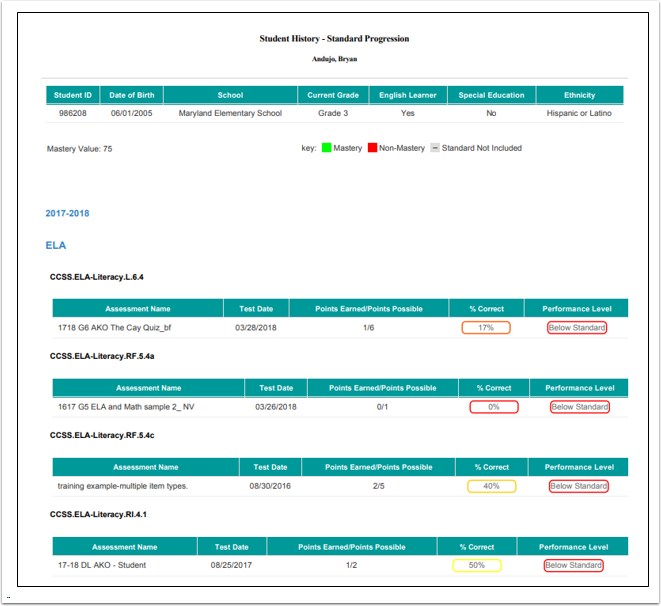 You may access a student’s history report from a Predefined Report that displays data by student. Select Reports in the Top Menu Bar. 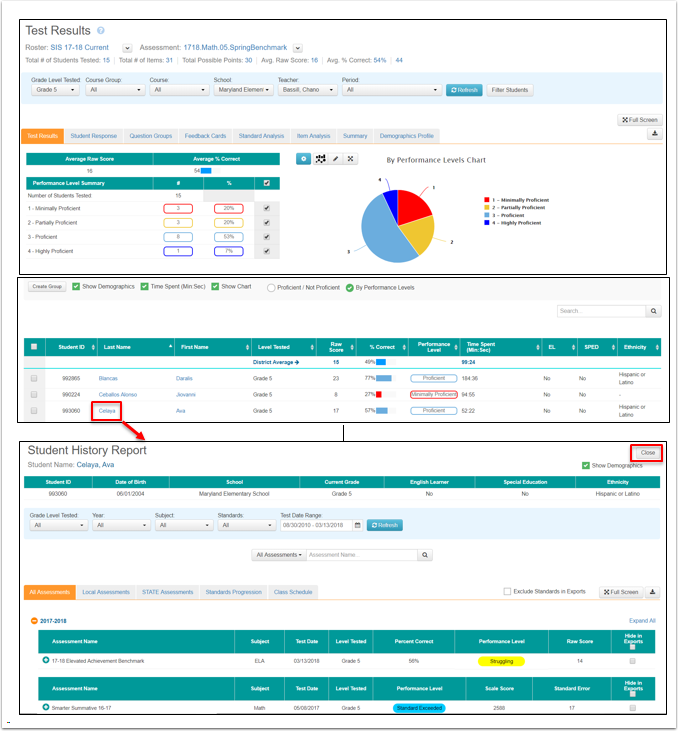 By default, the Predefined Reports tab will be selected as indicated by the orange color. Click on a student’s last or first name to go to the Student History Report for that student. Click on Close to exit the Student History Report and return to the main report.